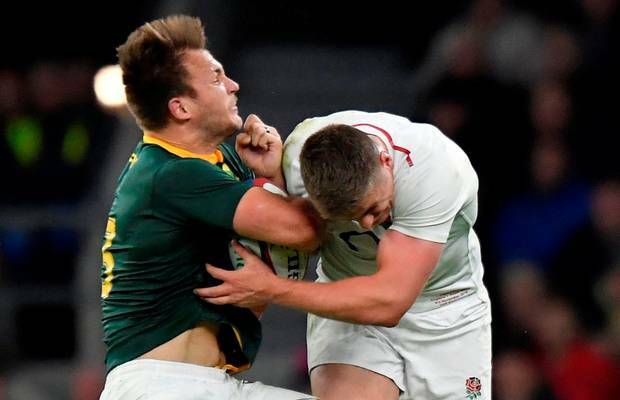 Damian de Allende and Mzwandile Stick insist it will be in line with World Rugby ‘standards’ for the Springboks to execute tackles like Owen Farrell’s hit on André Esterhuizen. Farrell’s controversial tackle in the 84th minute of last Saturday’s Test at Twickenham was deemed to be legal by referee Angus Gardner, who blew the final whistle instead of awarding the Boks a penalty. At the post-match press conference, a sarcastic Rassie Erasmus said the Boks should start tackling the same way, while on Tuesday, a video of Erasmus showing André Esterhuizen how to tackle like Farrell went viral. ‘Angus Gardner is a world-class referee, who is rated by World Rugby,’ said Stick at a press conference in Paris on Tuesday. ‘And if he says what happened at Twickenham was a fair tackle, I think that’s something we must also try because we are trying to keep up with the game and make sure we keep up with the laws. The Bok assistant coach declined to comment on the video, with De Allende asked if he had been doing a similar training drill.